Proofreading and copyediting have grown in popularity as side hustles, and for good reason because who wouldn’t love to get paid to read? A side hustle is a way for you to make extra money outside of your regular full-time job. It also lets you pursue something you’re interested in without having to quit your day job. In this post, I debunk some misconceptions about what you need to work with content, plus I’ve got a free training masterclass for you! When I was working in-house for a book publisher, I had a freelance proofreading side hustle that I did during the evenings and on weekends for businesses and entrepreneurs. I worked on non-book related content like marketing materials, reports, etc. It was a nice way to bring in extra cash, grow my network, and gain experience working in other industries. Not only have I side hustled as a proofreader and editor for other industries, but I’ve also made extra money on the side as a writer and marketer. So I know a thing or two about starting from scratch. Is A Side Hustle For You? Side hustles can be done by anyone, regardless of your age or background. In many instances, side hustles grow into full-time gigs, and proofreading and copyediting are skills that lend themselves well to that kind of growth. Once you’ve acquired the training in those two skills, then it’s a matter of refining them with work experience and exposure to content. 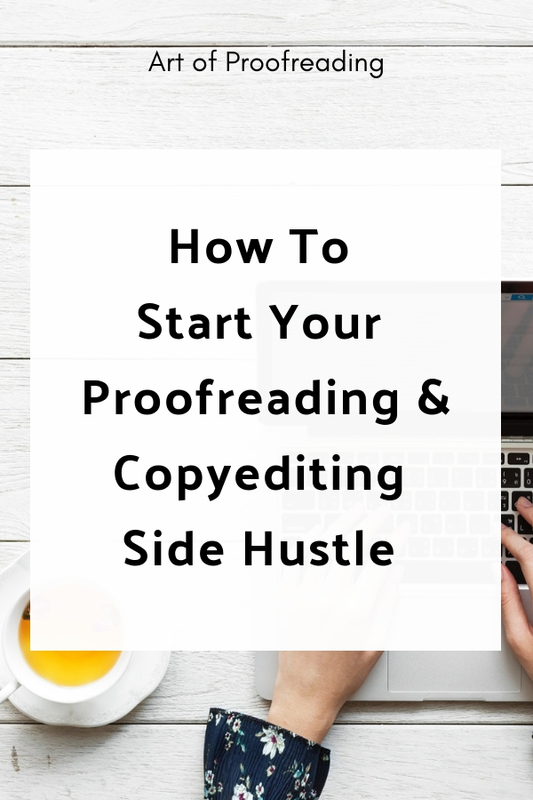 The success of my side hustle gave me the confidence and proof that I could make it as a full-time freelance proofreader and editor. Side Hustles Can Grow Into Full-Time Hustles! This masterclass isn’t just for people who want to make extra money. If you’ve always wanted to proofread or copyedit, or work with books for a living, then starting off part time and then growing your business to full time is an excellent way to begin. In fact, I highly recommend it. You should always take care of yourself, and financially that means making sure you have enough to keep a roof over your head, food on the table, and can pay your bills. You don’t want to put yourself in a stressful position where landing a project is a make or break for you. If your dream is to have a career as a proofreader and/or editor, then commit to making it work, and with patience, one day you’ll find yourself in a position where you can do it as your sole source of income. In fact, one of my students, Andrea (you might remember her from this interview) just quit her corporate job to freelance from home as a full-time proofreader and editor. Not only that, but she leveraged the skills she learned in my High-Level Proofreading Pro course to also offer book coaching services. Pretty amazing, no? In the masterclass, I’ll be covering the points I mentioned above, but I want to clarify some things first. There seems to be some misunderstanding that you need to be a world-class language ninja to even be able to think about proofreading or copyediting professionally. That’s not true. I’ll go into more detail about that in the masterclass, but below I’ve addressed some misconceptions people have about editorial work. I want to make it very clear that you do not need to be a grammar expert, have a degree in English, or be a member of the language police to work as a proofreader or copy editor. English doesn’t even have to be your native language. I’ve trained many students whose second language was English. As long as you love to read, have an eye for detail, and have a great command of English, you can learn to proofread and copyedit. Did you know there’s more than one type of English style? Whether you know US, UK, Canadian, or Australian, you can absolutely expand your knowledge and reach a global audience. You don’t need to know everything about the English language and all of its rules and exceptions in order to start working. That’s impossible. A big part of being a proofreader and copy editor is researching. Starting a side hustle on top of your day job doesn’t mean you have to be a slave to work and say goodbye to your social and family life. Since making extra money is a part-time activity, you can choose how many hours you want to put towards it. You can break down your time commitment by goals or money. If you want to bring in an extra $1000 every month, then you work towards that. If you’re keeping an eye on work/life balance, then commit to 10 hours a week on your side hustle, for example. How much time you want to invest is entirely up to you. Proofreading and copyediting don’t require a lot of equipment. All you need is your computer, word processing software, internet connection, and access to resources. Some resources are even available for free. What I like is that you don’t have to be confined to one space (unless you work on a desktop). You can easily pick up your laptop and go work in a coffeeshop on your lunch break or do some work while dinner is cooking. The reality today is that life isn’t cheap. Whether you want to pay off debt, contribute to household bills, save for a big purchase, or you just want some financial breathing room, side hustles are a way of life for many people. They’re also a great gateway experience towards a new full-time career. If you’re ready to start making extra money proofreading and copyediting, then click here to sign up for the free masterclass with me. I’m looking forward to seeing you there.